This piece is a beautiful example of late 18th Century Satsuma, probably the artist is Kinkozan (much of his more ornate work was done from 1880-1890). Kinkozan and Shisui liked painting butterflies and families with children, particularly on miniature or half-sized porcelain. Works by these two artists are expensive. For example: a 6 1/2 inch vase with the same level of ornate diapering and gold guild (with women and children) would cost anywhere from $4,000 to $7,700. The signature is probably Kinkozan's (the top symbol is his own signature, the bottom represents that he is an "artist". I see the bottom symbol on many works when signed with 2, 3, or 4 symbols in a block. Usually the symbol at the bottom of this cup represents the "official title of porcelain artisan". The Samurai warred among themselves for almost 1000 years. It was not until 1600 AD that a great victory was achieved by the Tokugawa Family. The Emperor invested the ”Shogun” title on the Tokugawa ruler and Yedo became the capital of Japan. It is now the well-known city of Tokyo. Japan cut off trade with all countries except China and Korea for much of this period. During the early Edo period, perfection was strived in all aspects of artwork and crafts. The local daimyo (ruler) set up kilns on their private estates. The pottery and porcelain, which were generated from these private kilns, were for the local daimyo’s utilization alone. The first Americans to attempt to reestablish shipping connections with Japan were under the command of Commodore Mathew Perry. On June 8, 1853, Perry visited the Port of Kanagawa and was turned away. However, in 1854, a Treaty was established and the Treaty of Kanagawa afforded Commodore Perry and his ships to open limited trade lines with America. It was not until 1858 with the Treaty of Shimoda that Japan officially did open trade canals with the United States. In 1867, Satsuma was a Province with a strong army (due to their imports of weapons from the West). In addition, the Choshu and Tosa Provinces in 1867 toppled the then ruling Tokugawa Yoshinobu reign when Choshu and Satsuma forces warred and won the Tokugawa territories. On January 3, 1868, Emperor Meiji abolished the Shogun Office which had been held by the Tokugawa Family, and thus brought an end tot he Edo period in Japanese history. Japanese pottery and porcelain articles were originally produced for use in ”cha no yu” (the tea ceremony). 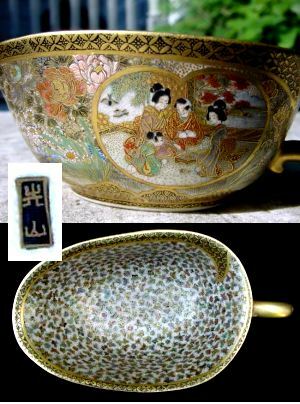 The enameled pottery (faience) wares of the Edo period represented the courtly taste of the Daimyo, and included Satsuma wares and Satsuma of various schools. A prominent Westerner named Ernest Francisco Fenoliosa (1853-1908) is credited for creating the National Treasures Law, enacted in Japan in 1884. This law prohibited any significant artwork or porcelain to be traded outside of Japan. During the Edo period (1850’s), borders on porcelain contained dragons and the Shimazo Mon (cross in circle) of the Shimazu Family. The central motif on much porcelain and artwork were of Rakan (Buddhist followers without halos). The wares were finely enameled in pare hues and gilt of gold and silver. Satsuma yaki (as it is called for Satsuma pottery wares) was produced by these potters under the rule of their local daimyos. They were the potter’s sole support, so they would often create elaborate yaki for their daimyo in return for favors. Therefore, the potters rarely signed their works, because it was unnecessary to do so. The works were for the exclusive use of the daimyos. It was only with the export trade that signatures began to flourish on Satsuma wares. The Shimazu clan were collectors and among their treasures were Chinese ceramics. They were offered to the potters for study, and a source of revelation for the potters. Thus, the strong Chinese trend in design of the early period Satsuma yaki. Earliest Satsuma yaki were styled after Korean prototypes with red and red/brown paste which was covered with colorless transparent glaze. The only ornamentation then was a Mishima (or simple ”natural” design) until the artisans were enlightened by the Chinese study articles. Ko Satsuma yaki included articles for use in cha no hu. They were small in size. ”Ko” represents ”early”. Early Satsuma yaki, particularly the more refined of the pottery, is very sought after today. Some of those articles would include facsimiles of Sawankaloke (Thai) wares, with designs executed in brown. Up until 1787, Satsuma wares were not decorated in easily recognizable decorations. Satsuma yaki was void of any form of enameled ornamentation until the Kwansei era (1787-1800). That era began the enameled ornamentation period and the employment of a full range of colors, including gold. Motifs used on middle Satsuma period (1787-1868) articles were for the most part elegant interpretations of nature. The employment of figures (Rakan, warriors, demons, etc.) was not done until the end of the Edo period (1850-1860). This era began the incorporation of figures, Rakan, processions, warriors, and demons. Osumi Province (Chosa kilns included) employed bold brilliant motifs. It also produced very defined crackles. The motif generally was enhanced with bold gold outlining, gold jeweling which highlighted the decoration and was generally gold in appearance. Bold gold outlining and gold jeweling which enhances the decoration were often seen on yaki. Thus, Osumi province wares were bold and Satsuma province wares were more subdued. Crackles are the first, and probably most important characteristic, of Satsuma wares. The crackles enhanced the article by producing a play of light on its surface. During early and middle Satsuma period, the ceramicists were careful not to hide or cover up the entire crackle ground, unless ordered to do so by the daimyo. Only on modern period wares were the entire crackle covered up with mono or polychrome enamels. Rim glazing is also an aide for age evaluation. During the Edo period to 1900’s, the rims of covers were often left unglazed. During the Edo period, the entire undersides of lids were generally left unglazed. The Edo period Satsuma generally have motifs containing chrysanthemums (16 petals exactly); pauloconia blossoms; maru mitsu aoi (asarum) which all represent the Mon of the Imperial Court and the Tokugawa Shogun. During the Showa period (1928-1934), the motif is of Rakan and dragons and is used extensively during the Showa period (pre-World War II). The motif is of tilt, black, red/brown, with white and black accents. Small scenic medallions are scattered throughout, along with a cross and circle Mon in gold (the Mon of the Shimazu Family). The Meiji Period begins in 1910, followed by the Meiji-Taisho period beginning in 1915, followed by the Taisho-Showa period beginning in 1925-28. The final period is the Showa period beginning in 1928-30. Blanks had become popular during these periods and the pricing and value for them is equivalent to Satsuma wares decorated in Japan. The role of rarity plays an important role in pricing Satsuma wares, that and an unusual size or shape. Satsuma cloisonné is prices comparably to original Satsuma wares. The only authentic Satsuma Mon is the ”blue” Shimazu Family Mon (cross and circle) on any porcelain item. When the cross in circle Mon is found not of blue, it probably was made no earlier than 1868. Main source: Treasury of Satsuma by Sandra Andacht. Wallace Homestead Book Co., 1912 Grand Avenue, Des Moines, IA 50305 Pub. Date: 1981 - 1st Ed.